A currency dealer works in front of electronic boards showing the Korea Composite Stock Price Index (KOSPI) (R) at a dealing room of a bank in Seoul, South Korea August 29, 2017. LONDON - World stocks hit a record high on Monday and the dollar reached an eight-week peak against the yen on expectations that the U.S. Federal Reserve will this week announce trimming of its balance sheet, part of a reversal of cheap money worldwide. 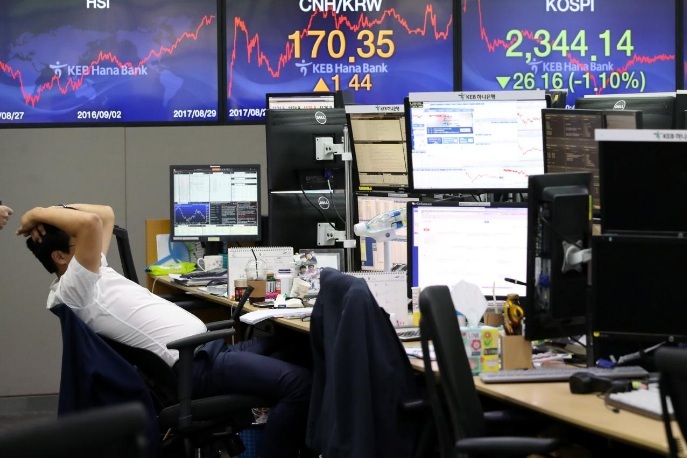 As investors breathed a sigh of relief that the weekend passed with no new provocation by North Korea, Europe’s main share index opened at a six-week high. MSCI’s broadest index of Asia-Pacific shares outside Japan .MIAPJ0000PUS had earlier risen to heights not visited since late 2007. That nudged MSCI's index of world stocks to a new all-time high .MIWD00000PUS, adding to gains seen on Friday when Wall Street set its own record level. “The FOMC’s latest verdict will be of special interest,” said Daniel Lenz, an analyst at DZ Bank in Frankfurt. An address by U.S. President Donald Trump to world leaders at the United Nations on Tuesday, and elections in Germany and New Zealand will add extra political uncertainty to the mix this week. But the main event will be the Fed’s meeting on Tuesday and Wednesday, at which it is likely to take another step toward policy normalisation amid what is rapidly becoming a global trend. Canada has already hiked interest rates twice in recent months, while the Bank of England shocked many last week by flagging its own coming increases. The European Central Bank is meanwhile expected to shed more light on plans to exit its extraordinary stimulus in October. Yet persistently subdued global inflation despite a pick-up in growth remains the “trillion dollar” question for central banks looking to normalize policy, a report from Bank for International Settlements said on Sunday. As such, investors are far from convinced the Fed will move on rates again this year, with a December change put at less than a 50 percent probability in the futures market. “It is fair to say that in our recent travels most of the investors we have spoken to question not just a December hike, but whether the Fed will hike at all again this cycle,” said Tom Porcelli, chief U.S. economist at RBC Capital Markets. U.S. government bond yields US10YT=RR jumped a hefty 14 basis points last week, but were little changed on Monday, as were most developed bond markets. In Europe, the eye-catching move was a sharp slide in Portuguese yields on the country regaining an investment grade rating after 5-1/2 years. In currencies, the dollar gained 0.5 percent against the yen to hit 111.42, its highest since late July. The Bank of Japan is widely expected to maintain its massive asset buying campaign at a meeting on Thursday. Political uncertainty also made a surprise appearance after sources said Japanese Prime Minister Shinzo Abe was considering calling a snap election for as early as next month to take advantage of his improved approval ratings and disarray in the main opposition party. Against a basket of currencies, the dollar was up around 0.2 percent at 92.069 .DXY. Sterling touched its highest since the Brexit vote on Monday after notching its best week in almost nine years against a currency basket. Investors will be keeping a close eye on a speech by BOE Governor Mark Carney later on Monday. HSBC sees two more rate hikes by the BoE between now and the end of next year. Talk of monetary tightening and a bounce in the dollar put gold on the defensive. The precious metal was off 0.4 percent at $1,314.43 an ounce. World stocks hit a record high on Monday and the dollar reached an eight-week peak against the yen on expectations that the U.S. Federal Reserve will this week announce trimming of its balance sheet, part of a reversal of cheap money worldwide.